Underlayment is the first layer of material laid prior to metal roofing panels. Roof underlayment plays a vital role in any roofing application. Its primary purpose is to act as a water-shedding layer, providing a secondary layer of protection from weather, shielding the roof deck during construction and is often required for warranty adherence as well as roofs that must meet Underwriter’s Laboratory (UL) fire ratings. Asphalt-saturated felt - One of the most common types of underlayment used in residential, steep-slope applications are black, asphalt-saturated felt paper. The most basic of all underlayment, it is also the least expensive. Engineered asphalt saturated felt (Gorilla Guard 30 & Gorilla Guard Spec 30) – A stronger, more durable version of saturated felt that is engineered with fiberglass and patented water shedding properties. Synthetic (Summit 60 & Summit 180) – Manufactured from polypropylene polymers, synthetics are designed to provide greater resistance to damage and deterioration. They are lightweight, high strength and feature non-skid properties. Synthetics are resistant to fungal growth as well as wrinkles, since they don’t absorb moisture. They’re also highly resistant to UV damage and can be left exposed to weather for periods up to six months. Atlas synthetics include Summit 180 and Summit 60. Peel & Stick underlayment – Self-adhering SBS modified peel & stick underlayment is appropriate for a variety of applications, including metal roofing. SBS asphalt results in this underlayment self-sealing around fasteners, such as cap nails. Peel and stick underlayment has a variety of non-skid top surfaces that include granular, polyester and film and are fiberglass-reinforced. WeatherMaster offers two high temp options for use under metal. 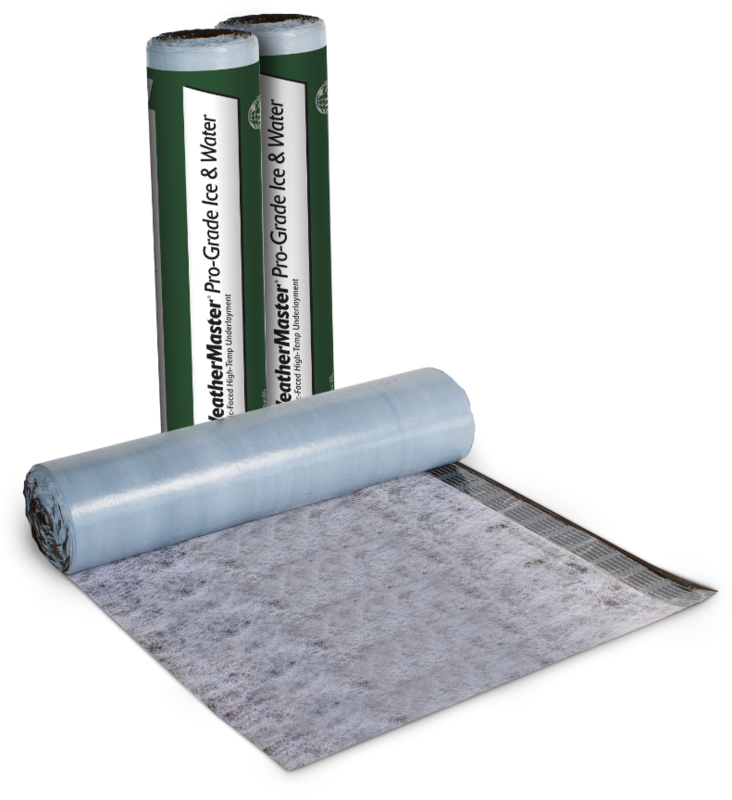 WeatherMaster Pro-Grade Ice & Water is a high-temp polyester faced underlayment and WeatherMaster Flexible is a high-temp film faced underlayment. Slope Limitations: On low-slope roofs, which include 2:12 up to 4:12 pitch, felt courses should overlap a minimum of 19 inches. This provides a double layer of underlayment across the entire roof. On steep-slope roofs (4:12 and steeper), the upper courses of felt underlayment should overlap lower courses by at least 2 inches. Fastening: Atlas recommends that all underlayment be mechanically fastened using plastic cap fasteners. Atlas recommends the use of any of the above underlayments to be used under metal roofing.